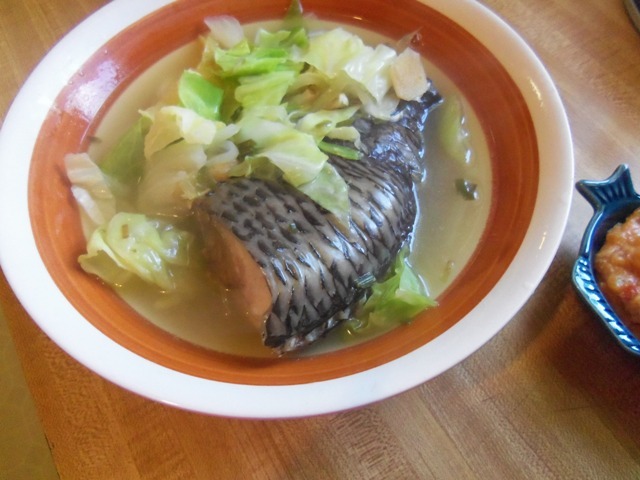 A friend cooked this for me once when the only Filipino fish soup I knew was sinigang. I thought she had forgotten the souring agent but I was wrong. For those who do not like the sourness of the ubiquitous Filipino sinigang, this is a nice, mild alternative. It is delicately spiced like your grandmother’s tinola (or chicken soup) and actually, it is exactly the same as chicken tinola except that you use fish instead. When I saw the Pesa recipe on the Overseas Pinoy Cooking Blog, I was immediately intrigued not to mention hungry! I just had to make it and luckily, I had one leftover tilapia in the freezer. I felt a lunch time soup coming on. Yes, even when it’s ninety degrees and humid outside, I craved to have this soup. In a pot large enough to hold your soup, heat the cooking oil and sauté the ginger and leeks for a couple of minutes. Pour in the water or rice water and add the peppercorns. Bring to a boil and let it simmer for about 10 minutes to blend the flavors in the soup. Add the fish, cover and let it cook for another ten minutes or until the fish is cooked through. Add your vegetables and cook only until they are wilted. You don't want it overcooked. I used cabbage for the vegetables in this instance because that's what I had in the refrigerator at the time. Any green leafy vegetables like bokchoy, napa cabbage, spinach or tender mustard greens will be perfect for this dish though. Also, in the original recipe, regular onions were also used in addition to the leeks. I happened to be out of onions too, so I used leeks that I pulled up from the garden instead. BY THE WAY, if you look at the original recipe, it was recommended that this dish be served with a miso dipping sauce. That’s what’s in the smaller dish in the photo above. I must say, that ‘dip’ is perfection! Recipe for it will follow. 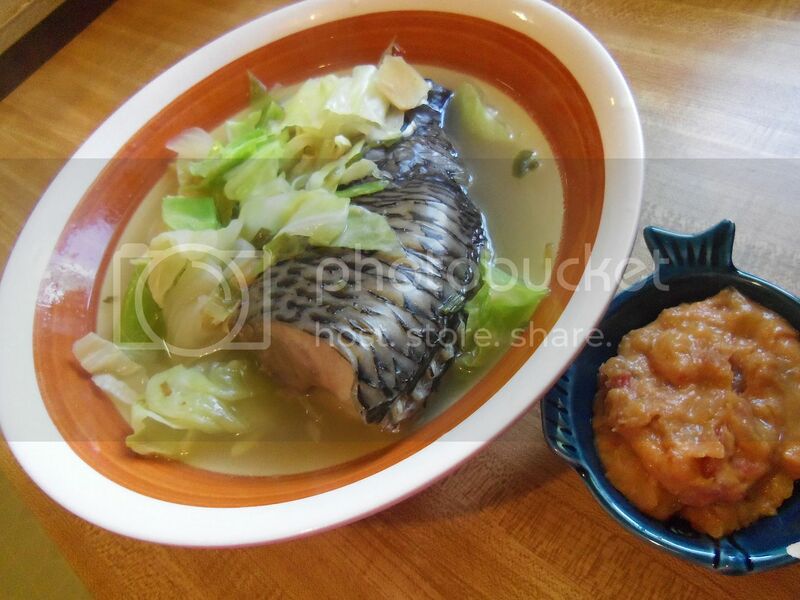 Pesang isda is one my family’s favourite, sort of a comport food, and yes the miso dip (LOL) is a must. Thanks JMom for the mention. I love this fish soup it really refreshing and giving you more appetite to eat with rice and very simple recipe.